Kashmir is an important tourist destination of India and the main source of income of the place depends on its tourism industry. Its sprawling mountainous landscape, scenic vists, blue lakes, and peaceful ambiance is indescribable but the essence can be felt even when you are back home. It also has an eventful history. Located in the northernmost region of India, it is home to numerous gardens and placid lakes. There are many tourist attractions in Kashmir that will simply leave you awe-inspired during your tour to Kashmir. The southernmost region of this state is Jammu and is drained by several rivers such as Ravi, Tawi and Chenab that acts as a water reservoir for the entire region. These rivers meander through the deep gorges thus enhancing the scenic beauty of this state. Kashmir is quite popular for the religious places since among the Kashmir tourist attractions there are many temples and holy shrines. Some of the most notable ones are Ranbireshwar Temple, Raghunath Temple, Bahu Fort & Gardens, Peer Baba, Mahamaya Temple, Lakshmi Narayan temple, Gauri Kund, Mansar Lake and Purmandal. Travel to Kashmir will be incomplete if you don’t pay a visit to the sacred shrine of the Goddess Vaishnodevi which is one of the most venerated and visited tourist attractions in Kashmir. Jammu and Kashmir is not only famous for the snow-capped peaks but also well-known for many gardens that are well-manicured and look simply incredible against the picturesque backdrop of the mist covered green valleys. Besides, there are also many architectural splendors that are equally mind blowing. Some of the prominent ones to catch a glimpse are the Shalimar Bagh, Nishat Bagh, Chashma Shahi, Pari Mahal, Hazratbal Mosque, JamaMasjid, Shankaracharya Temple, Makhdoom Sahib, Martand and Awantipur. Tourists who are well acquainted with the game of golf can check out the highest green golf course in the world and a premier ski resort in the winter. This place is ideal for taking a break from the usual chores of the city life and spending some quality time amidst peace and seclusion. The old monasteries and quaint little hamlets located in the mountainous region of Leh are among the highlights of tourism in Kashmir. Leh Palace, Shey Palace, Stok Palace, monasteries of Phiyang, Hemis,Thiksey, Likir, Spituk, Alchi, Lakes of Pangong and Tso-moriri have a significant place among the tourist attractions in Kashmir. However the journey to these places is strenuous but rewarding in ways more than one. 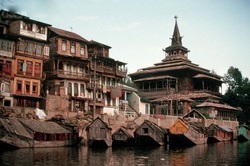 Kashmir has many options for lodging and boarding. Apart from that, Kashmir also has a fine travel network that allows you to reach this place quite conveniently by the air, rail and road transport. 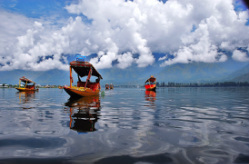 Travel Inn offers online information on the Tourist Attractions in Kashmir and also offers useful inputs about Kashmir. Shalimar Garden .Abode of Love. 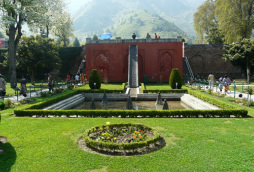 Located in Srinagar, Shalimar Gardens or Shalimar Bagh was laid out by Emperor Jehangir for his wife Nur Jahan in 1616. 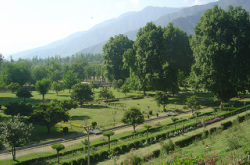 Shalimar Gardens are the magnum opus of Srinagar's many gardens and parks. This beautiful garden was originally named the Farah Bakhsh or 'delightful garden', but today it is known as the 'garden of love'. The garden features a canal, lined with polished stones and is supplied with water from Harwan runs through the middle of the garden. The fourth terrace was once reserved for royal ladies. It represents a pavilion built of black stone in the centre of the tank, which was used as a banquet hall. Shalimar Bagh has an air of solitude and quietude, and its rows of amazing fountains and shaded lined trees seem to retire towards the snow dressed mountains. Nishat Bagh .Garden of Pleasure. Nishat Bagh is smaller than Shalimar Garden, but is more movingly beautiful. Nishat Bagh was built by Asaf Khan, Empress Nur Jahan's brother. Nishat is celebrated for its stately chinar (plane) trees, imported to Kashmir from Persia by the Mughals. Among these, many of the giant chinar trees have been planted by the Mughal Emperors. Nishat has 12 terraces representing the 12 signs of the zodiac, which seems to gradually descend and merge in the Dal Lake's periphery. The terraces viewed along with the bed of flower, a mosaic of bright and beautiful colours, creates an unforgettable sight. Also found within its surroundings are some remnants of Mughal era buildings including a double storey pavilion enclosed on two sides latticed windows. Gardens of Chashma Shahi .The Royal Spring. Laid out by Shah Jehan, the gardens of Chashma Shahi, so named because of a mountain spring that waters it. The gardens include three terraces, an aqueduct, waterfalls and fountains. Cheshmashahi is the Ist Mughal Garden you will come across after Nehru Park. 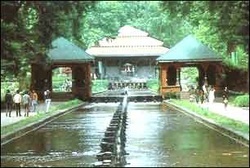 Smallest of the Srinagar Mughal gardens, the Chasma Shahi, or 'Royal Spring', are well set up the hillside, above the Nehru Memorial Park. The fresh water spring in these pleasant, calm gardens is renowned to have medicinal values. There is also a small shrine, the Chasma Sahibi, close to the gardens, which also has a fresh water spring. Pari Mahal was initially a garden founded by Dara Shiko, Mughal Emperor Shah Jehan's eldest son for his Sufi teacher, Mulla Shah. Once dotted with numerous springs, which have dried up now, the Pari Mahal gardens are now the treasure possession of the state. Pari Mahal is bedazzling with radiant lights at night, and though located on the spur of a hill, can he seen from most places in Srinagar. Pari Mahal, once a Buddhist monastery, was converted into a school of astrology by Dara Shikoh. Pari Mahal gardens are now fully maintained by the state government. It is one of the oldest and the most spacious of all the mosques in Kashmir, situated in the heart of the city.The foundation of the mosque, an architectural wonder. This impressive wooden mosque is notable for the 300 plus pillars supporting the roof, each made of a single Deodar tree trunk. The present mosque, with its green and peaceful inner courtyard, was rebuilt to the original design after a fire in 1674. The Mosque has had a chequered history: first built by Sulan Sikander in 1385, it was enlarged by Zain-ul-Abidin in 1402 and then destroyed by fire in 1479. Rebuilt in 1503, it was destroyed by another fire during the Jehangir's reign. The fort was originally built between 1592-1598 during the rule of Emperor Akbar. The present constructed by the Afghan Governer,Atta Mohammad Khan(1808-10),on the top of the Hari Parbat or Koh-e-Maraan hill. The architecture of the Fort is similar to that of the forts in Central Asia. It is clearly visible from the top of Shankaracharya Hill. The Hazratbal Shrine, which is situated on the left bank of the famous Dal Lake in Srinagar and is just at a walking distance from Nagin Lake. This unmatched reverence is anchored in the love and respect for the Prophet Mohammad (Peace be upon him), whose Moi-e-Muqqadas, (the sacred hair or Holy Relic) is preserved here. The shirne is known by many names including Hazratbal, Assar-e-Sharief, Madinat-us-Sani, Dargah Sharief and Dargah. Sadiq Khan,laid out a garden here and constructed a palacial building, Ishrat mahal or Pleasure House, in 1623. The construction of the present marble structure was started by the Muslim Aquaf Trust headed by Late Sheikh Mohammad Abdullah (The Last Prime Minister of Jammu & Kashmir) in 1968 and completed in 1979.The Moi-e-Muqqadas is displayed on various occasions related with the life of the Prophet (Peace be upon him) and his four holy companions (R.A). 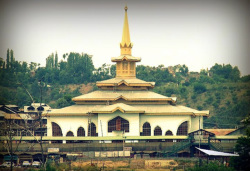 The Rozabal shrine is located in Khanyar, Srinagar and believed by the locals to be the burial place of Jesus Christ !Some people identify the sage buried there with oneYuz Asaf, that is Jesus of Nazareth, whom they allege to have arrived in Kashmir after surviving his crucifixion. Several authors have held the view that Jesus had travelled to the Indian subcontinent including Mirza Ghulam Ahmad and the Russian traveler Nicolas Notovitch. The tomb has gained increasing popularity as the possible tomb of Jesus. Historically, however, the Holy Sepulchre is considered by some Christians as the tomb of Christ. Standing in the Pir Panjal hills, outbeyond the airport, at an altitude of 2,700 metres, the meadow of Yusmarg is reputed to have the best spring flowers in Kashmir. The beautiful valley is at the foot of the Sangisafaid valley on the northern slopes of the Pir Panjal range. Just beyond the Wular and Manasbal lakes turn off from the Leh road, this pleasant little town marks the point where the icy Sindh Riverleaves the mountains and enters the plains. Gandarbal is the official headquarters of the Sindh valley and was originally called "Doderhom". Wullar Lake is the largest fresh-water lake in Indiais 60-km from Srinagar. 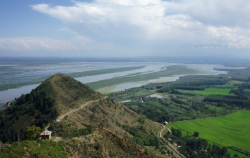 Spreading over a 125-km area, the lake, by drawing off excess water from the Jhelum, acts as a natural flood reservoir. Interesting ruins in the centre of the lake are the remains of an island created by King Zain-ul-Abidin. Betaab Valley is a very popular touristic destination. Betaab Valley is also a favorite campsite of travelers as it also serves as a base camp for trekking and further exploration of the mountains. The valley is a walk-able distance from Pahalgam. The crystal clear & chilly water of the stream bubbling down from the snowy hills is a delight; locals here drink this water too. Baisaran and Tulian Lake are few nearby attractions that can be visited. Gulmarg .The Meadow of Flowers. Gulmarg is also known as "The Meadow of Flowers" and in spring is just like that. With pretty views and green undulating country, Gulmarg is often called Switzerland of India. During winters it is famous for Skking and often National level skiing competition takes place here. Gulmarg has the fine 18 hole Green Golf course and is highest in the world (2680 meters) and is one of the India's prime winter ski resorts. The Cable car "Gondola" has 60 cable cons that ferry the tourists right upto the height of 3090 meters from 2690 meters at the base (Gulmarg). A circular road, 11 Km in length, runs right round the Gulmarg through pleasant pine forests with excellent views over the Kashmir Valley. Nanga Parbat is visible to the north and Haramukh and Sunset Peak to the south-east.The meadow of flowers "Gulmarg" is in the shape of a bowl, it is 3.5 Km in length and 1 Km wide. It comprises grassy slopes, with a small scattering of houses. The bowl is encircled by firclad hills, and in the distance are snow covered peaks. Gulmarg has long been famous for golfing. The 18-hole Gulamrg Golf Club, in existence for 100 years, has records dating from that time which make fascinating reading. The culb house, with its sloping roof, has a rare character. Temporary membership is permitted on payment of a daily fee. It is possible to hire clubs from the stock available at the Tourist Office next door. This smaller valley is about 6 Kms walk from Gulmarg. The meadow, carpeted with flowers in the spring, is the site for Gulmarg's winter ski runs and offers a fine view of the surrounding peaks and the Kashmir valley. A high mountain lake is about 13 Kms from Gulmarg at the foot of the 4511 meters Apharwat Peak, this lake is frozen until mid-June and even later in the year one can see lumps of Ice floating in its cold waters. Sonmarg is a quite valley, carved by the Sindh river and circled by placid lakes and awesome glaciers. Sonmarg is also known as "The Golden Meadow". At an altitude of 2740 meters, 85 Kms northeast of Srinagar, the road that leads to Sonmarg is almost like heading for an enchanted journey into Wonderland of Nature.The road that intially winds under the shadow of the mountain, crosses the Sindh at Wayil, 27 Kms from Srinagar, where the Valley widens.Onward, past Kangan and Gund, the road runs through peaceful pastoral land, the snowclad Harmukh range, and after a steep rise is the entrance to the "Meadows of Sonmarg . Sonmarg is also known as"Gateway of Ladakh". 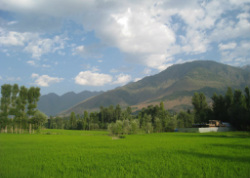 Surrounded by mountains upto 5,300 meters, the Valley is divided by a spur of the Thajwas range. The spur dividing the valley is covered by fir, pine, silver birch and sycamore trees. Sonmarg carpeted with colorful flowers, lies on one side, drained by the Sindh river which has its source in the Glaciers of the Amaranth range. Meandering, through the Valley, the Sindh river is an excellent fishing preserve, abounding with trouth and Mahseer. The Fishing Permission can be obtained from the Department of Fisheries, located at Gogji Bagh, Srinagar. Legend has it that Shiva recounted to Parvati the secret of creation in a cave in Amaranth. Unknown to them, a pair of mating doves eavesdropped on this conversation and having learned the secret, are reborn again and again, and have made the cave their eternal abode. Many pilgrims report seeing the doves - pair when they trek the arduous route to pay obeisance before the ice-lingam (the phallic symbol of Shiva). The trek to Amaranth, in the month of Sharavan (July - August) has the devote flock to this incredible shrine, where the image of Shiva, in the form of a lingam, is formed naturally of an ice-stalagmite, and which waxes and wanes with the moon. By its side are, fascinatingly, two more ice -lingams, that of Parvati, and their son, Ganesha. According to an ancient tale, there was once a Muslim shepherd named Buta Malik who was given a sack of coal by a Sadhu. Upon reaching home he discovered that the sack in fact, contained gold. Overjoyed and overcome, Buta Malik rushed back to look for the Sadhu and thank him, but on the spot of their meeting discovered a cave and eventually this became a place of pilgrimage for all believers. Till date a percentage of the donations made by pilgrims are given to the descendants of Malik and the remaining to the trust, which manages the shrine. Yet another legend has it that when Kashyap Reshi drained the Kashmir Valley of water (it was believed to have been a vast lake), the cave and the lingam were discovered by Bregish Reshi who was traveling the Himalayas. When people heard of the lingam, Amaranth for them became Shiva's abode and a center of pilgrimage. Situated in a narrow gorge at the farther end of Lidder valley, Amaranth stands at 3,888 m and is 46 km from Pahalgam and 141 km from Srinagar. Though the original pilgrimages subscribes that the Yatra be undertaken from Srinagar, the more common practice is to begin journey at Chandanwari, and cover the distance to Amaranth and back in five days. Pahalgam is 96 km. Srinagar. The trek from Chandanwari to Amaranth cave is on an ancient peregrine route. The 30-km distance is covered in two days, with night halts at Sheshnag (Wawjan) and Panchtarni. The distance from Pahalgam to Chandanwari (16kms) now be covered by vehicular transport, and the trail runs along the Lidder river. Pilgrims camp at Pahalgam or Chandanwari on the first night out. The first day's trek of 12 Km, from Chandanwari is through spectacular, primeval countryside, and the main center of attraction is Sheshnag, a mountain that derives its name from its seven peaks, resembling the heads of a mythical snake. The journey to Sheshnag follows steep inclines up the right bank of a cascading stream and wild scenery untouched by civilization. The second night's camp at Sheshnag (Wawjan) overlooks the deep blue waters of Sheshnag Lake, and glaciers beyond it. There are legends of love and revenge too associated with Sheshnag, and at the camp these are recounted by campfires, to the stillness of pine scented, Himalayan night. The Second day's 12 km trek steadily gains height winding up across Mahagunus Pass at 4,600 m and then descending to the meadow - lands of Panchtarni, the last camp enroute to the holy cave. From Panchtarni to Amaranth is only 6 km. But an early mornings start is recommended for there is a long queue awaiting entry to the cave. The same day following Darshan, devotees return to Panchtarni in time for Lunch, and continue to Sheshnag to spend the third night out. They can also spend the night at Panchtarni itself returning to Chandanwari / Pahalgam like the onward journey. Entrance to the cave is regulated, and Darshan a hasty affair for there are many others waiting outside to pay homage before the awesome Shivalinga. The devotees sing bhajans, chant incantations, and priests perform aarti and puja, invoking the blessings of Lord Shiva, the divine, the pure, the absolute. For those who journey with faith, it is a rewarding experience, this simple visitation to the cave-shrine, the home of the Himalayan mendicant who is both destroyer and healer, the greatest of the Hindu Gods. The Second approach to the Amarnath Cave is from Sonmarg via Baltal. Sonmarg (3000 meters) is situated on the Srinagar - Leh highway 85 Kms North - East of Srinagar. About 15 Kms. further ahead lies the base camp, BALTAL, which is a little charming valley lying in the foothills of Zojila Pass. The Holy Cave of Amarnath Ji is just a days journey away from here. At Baltal, free langer facilities are provided by vouluntary organisations for Yatris. The traiil from Baltal to the Holy Cave lies along very steep hill sides and, therefore, great care needs to be taken while some tented tea stalls are established at "Bararimarg" and "Sangam Top". Several snow bridges on the fast flowing streams have to be crossed over, while during the Holy Cave is quite near, the trail from Pahalgam meets the Baltal route. At Baltal, riding / pack ponies, dandies, porters etc. 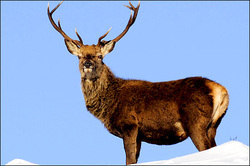 are available on approved rates from the J&K Tourism, Government of Jammu and Kashmir.